This leaflet provides guidance on listening to young disabled children, including inspiring examples of listening practice and significant updates on policy following the Children and Families Act, 2014. The leaflet covers three areas of activity; listening to individual children, everyday listening and consultation, and inclusive strategies and developing a listening culture. It highlights why it’s important to listen to young children and provides information on how adults can do this well to enable children’s right to express their views on matters that affect them, and to have their views taken into account. 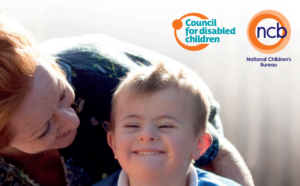 The advice in this leaflet can be applied to a healthcare setting, as well as any other setting involving communication with a disabled child or young person. This resource was written by Mary Dickins and Lucy Williams. Published by the National Children’s Bureau in association with the Council for Disabled Children, as part of the ‘Listening as a way of life’ series. The Listening as a way of life series provides a guide to help practitioners design creative and individual ways of listening to children and to each other.